yay!!! congrats!! cute dress! Did you make it? Look at her go. I love the hands up and the curled toes. One of my favorite times. Congratulations???? I bet she's saying..."see! i told all of you i'd do it when i was good and ready. thankyouverymuch." So she decided it was time... Very cute bald baby indeed! SO CUTE! How old is she??! Ella's about to walk too but we're not quite there yet... I love the dress too... she's just perfect. 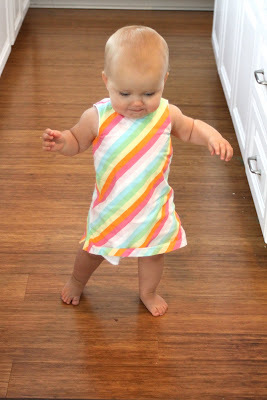 Babies first steps always remind me of little drunks stumbling along. (Though adorable diminutive drunks.) ;o) However, your girl is supremely graceful and not stumbling like a drunk at all. Oh my goodness! oh my goodness! This is BIG... she's on the move...watch out world! she's walkin' and she's on a mission! p.s. I've got a batch of your toffee crack in the oven right now -- can't. get. enough!! OMG, she can not be any cuter! I want to eat her up!!! Yay, Bald baby! You go girl! What a sweet heart ~ love the dress too! What a BIG girl!!! See, she just did it on her own timetable. Love her dress and her proud face! She's just so cute. Everytime I see her, I just wanna squeeze her tight. 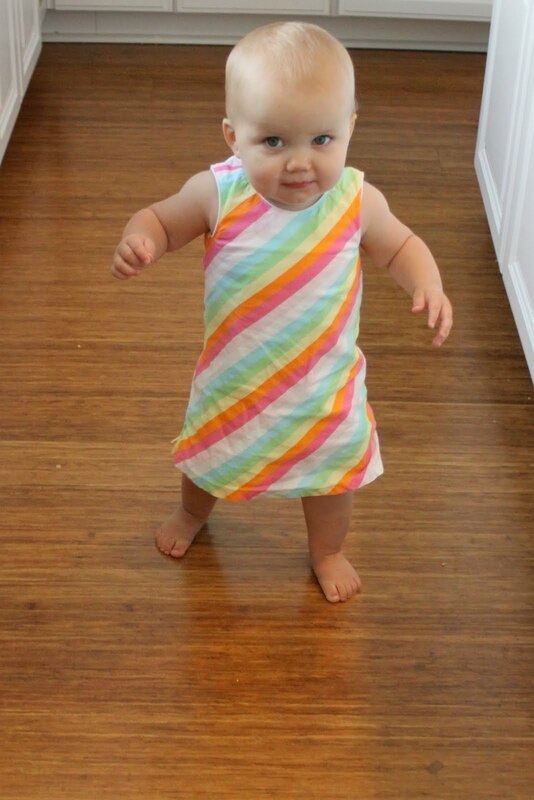 Bald Baby looks adorable walking. I love in the beginning when they first start walking how they do the Frankenstein walk, too cute. so do i get to call her a kid now? Bald babies are just the cutest...I have 2! Eldest Kiddlywink had 1inch long pigtales at 2 & her first haircut at 3. Now that she is knocking on 4 it is half way down her back but springs into shoulder length spirals. Youngest Kiddlywink is 20 months now & barely has a layer of fluff! GO BALD BABIES! And congratulations on your first steps! My girl is attempting to climb on the couch. And she can't walk a lick at 14 months. Hehe. i always when they start walking they look so short. cutie pie in her stripes. Cute!!! My little boy is 8 weeks old and I can't imagine him walking or talking! Soon enough, I suppose. hooray! i think i'll celebrate for you and her with an ice cream sundae! yes, i'll take any reason for an ice cream sundae! :) love your bald baby and your blog! I have to admit that your cute "bald baby" makes me smile EVERY TIME! Precious!! And now she's on the move :) Congrats! yay Janey!!! cutest little bald walking baby I have ever seen! Holla! I knew she'd do it soon. YAY! That is so great! what a cutie! Okay, seriously, little ones walking is just my favorite. I could watch them all day. Those pictures just make me happy. They are just so little and proud of themselves and they sway as they walk. It is great. Oh.My.Word! 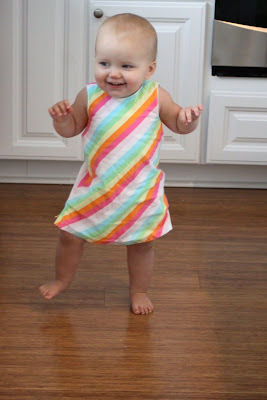 Bald Baby is too cute for words strutting her stuff! Keep up the fabulous work Bald Sweet Pretty Baby! Precious!!! I love it when they just learn to walk! That's awesome! I love those first stumbly steps! :) precious! Yay! Go bald baby, go!!!!!!!!! She is SO cute! So cute! I knew she could and I knew she would! Yea! before you know it, that bald baby is going to be bust'n dance moves! make the cuteness stop! man alive! i could just cuddle her all day! What a doll! Where did you get the dress? Its adorable!! She is so precious but now very dangerous! She is so adorable! YAY for walking! 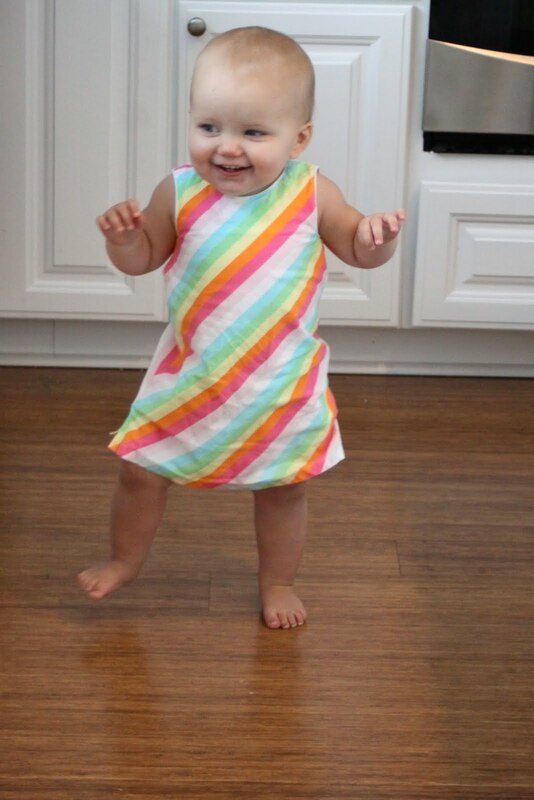 She is TOO cute and I love her little dress! 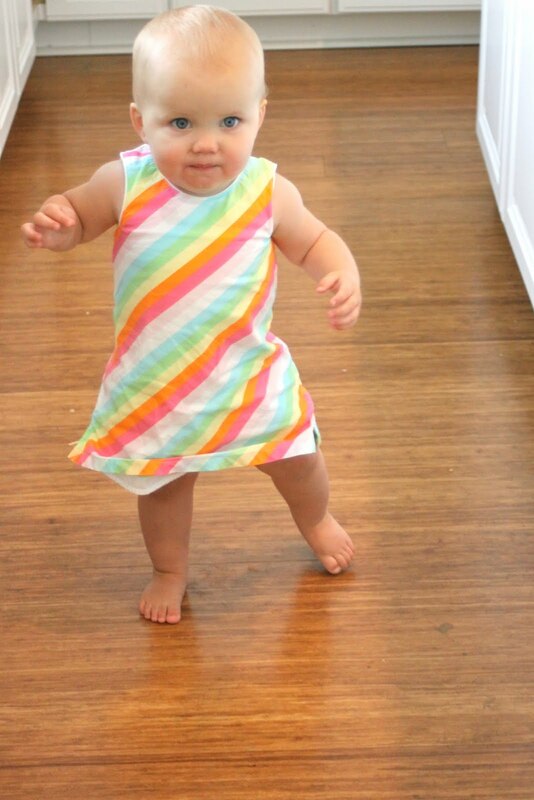 I remember when my baby girl started walking. So amazing!! She looks so adorable in that dress. Love your blog, I'm an avid follower! Oh, I have a bald baby too, but he is 19 months old! Your daughter is darling! I'm glad to have found your blog through Pleated Poppy! Please come by and visit the Southern Institute and say hello when you get a chance! my kids are bald too - that dress is adorable on her. I so miss that age!! Awww! What a cute "bald baby"! I remember when mine had to go and learn to walk. *sigh* Oh well. Can't stop 'em from growin! Yeah for Janey! So excited for you! Look out world here she comes! I'm normally just a non-posting reader (aka lurker) but oh that sweet girl with her rubber band roll ankles and wrists is TOO MUCH! Be still my aching ovaries. Nothing like the huge boost of confidence walking brings to little souls. Running isn't too far behind. congrats! she is so cute!!!! This is good news for my own still-not-walking 16 month old. 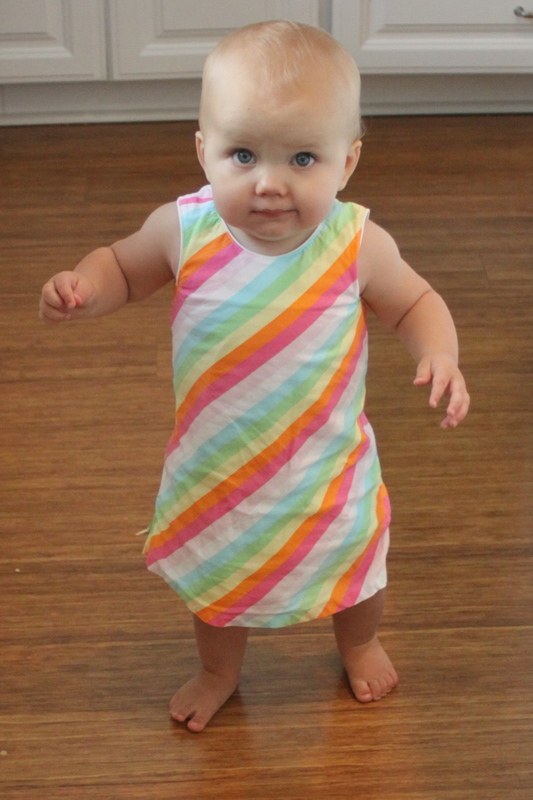 Since she's a month younger, maybe that means at the end of June she will be walking herself. One can hope.